As the temperature continues to climb and we get later into the summer you will see more and more butterflies. Make sure you have a varietyof nectar and host food in order to increase the variety of butterflies in your yard. Milkweed for monarchs, fennel, parsley, and citrus for swallowtails, and passionvine for the Gulf fritillaries are all great host plants. Cone flower, pentas, black eyed Susans, buddelia, and Queen Anne’s lace are some of the many nectar plants. 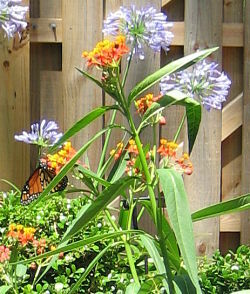 Check out the butterfly article in the garden writing tab for more information on the specifics of butterfly gardening. Tell me what butterflies you are seeing in your area. There’s been a Black Swallowtail in my garden for several days now. I’ve been checking the fennel and parsley daily, but no eggs or caterpillars have been found. This afternoon I went out in hopes of taking some pictures of butterflies. I knew I’d see the Monarch because she has been there for at least a week (I’m still waiting to find eggs and caterpillars on the Milkweed). I was hoping to catch a shot of the Black Swallowtail- what I got was even more exciting! After looking around the yard for the swallowtail and not finding it, I went to the fennel and parsley just to see, if by chance, I’d find eggs. Alas! What seemed to be hundreds were all over the fennel. I’m still learning how to take macro shots so it took a while to get a couple of clear photos for the blog. Here they are! 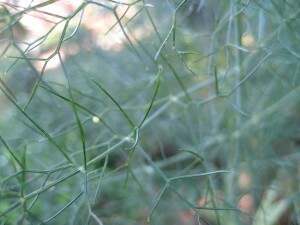 Then I looked at the fennel without the camera and there right before me was a caterpillar! It had to have been there for days because it is kind of big. 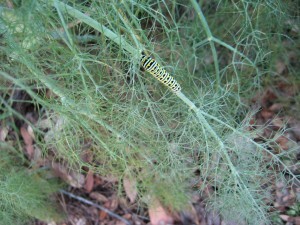 As I studied more closely the fennel, there was an even larger caterpillar. I’m so excited I can’t stand it. Now I need to pull out my butterfly box, make sure it’s clean- no spiders or critters that would hurt the caterpillars, and start watching the transformation! I’ll keep you posted with the progress- such fun. 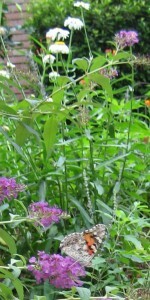 Join me and design your butterfly garden today- you will be so glad you did. Yesterday, this monarch stayed in my backyard all afternoon. I wish I could have caught her on video, but I was lucky to catch this still shot. My nectar plants are in bloom now so the butterflies have lots of options- buddeleia, penta, milkweed,a variety of salvias, and more. I’m including another pic of her on milkweed. So far, no eggs… maybe tomorrow. 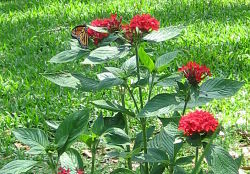 Take your garden to another level with butterfly gardening. Check out my article “It’s All A Flutter in the Garden” for more information on how to create one in your yard.